Nongkhon School Brain Based Learning Playground Hand Over 20 Sep 18. Rotary Club of Royal Hua Hin hand over the Brain Based Learning Playground they have paid to have created to Nongkhon School. The Rotary club of Bangkapi Bangkok arranged the 48th Annual Children's day at the Regent Cha Am beach resort. 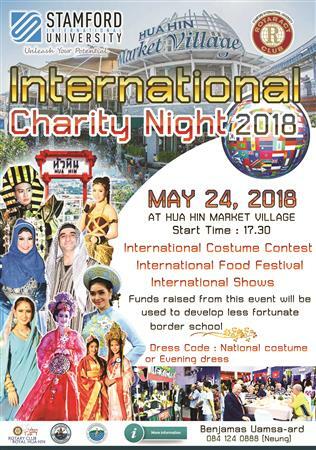 Thursday 24th May 2018 saw the International Charity Night organised by Stamford International University Hua Hin and Rotaract. The stunning event was held at Market Village and funds raised went towards less fortunate border schools in Thailand. SIU Rotaract are sponsored by the Rotary Club of Royal Hua Hin, who donated B10,000 towards the evenings prizes, and members attended to support the occasion. Also present were RCRHH Sister Club, the Rotary Club of Hua Hin and both Presidents, P.Birger Rexed and P Khun Wasana Rai, together with Pierre Bourgoin, Director of SIU and main organiser RCRHH Charter Member Khun Benjamas Umsa-Ard, who works at the University. The evening consisted of an International Costume Contest, Food Festival and shows, all overseen or performed by students from the University. A great evening, and a tribute to Rotaractors, SIU,K Benjamas, but particularly to the students who made so much effort with their costumes, performances and the food. Tuesday 7th August 2018 saw five members of the Rotary Club of Royal Hua Hin visit Stamford International University to talk to students about the benefits of Rotary and of joining Rotaractors. President Brian Anderson was joined by Immediate Past President Birger Rexed, President Elect Napa Keawtem, Secretary Martin Harrison and Rotarian Benjamas Uamsa-Ard, who also works at SIU and is responsible for co-ordinating the Rotaractors on behalf of the club. 8th Annual Multi-Club Dinner held at the Amari hotel Hua Hin on the 8th February 2019. Stamford Rotaractors Beach Litter Pick 16 Aug 18. RCRHH Join Stamford International University Rotaractors and Chinese Students on a beach litter pick, Thursday 16th August 2018. RCRHH handed over a cheque to Hua Hin Hospital for 8 computers to be used in the outpatients department. A Rotarian from RCRHH donated a further two computers to the hospital. RCRHH support Hua Hin Municipality in its health drive and preservation of the city. RCRHH assist SIU Rotaractors hosting Stamford University who hosted games providing lunch for school children at the Raaprajanugroh 47 School. Students from Stamford University displayed some of their art work on Thursday 31st January 2019.